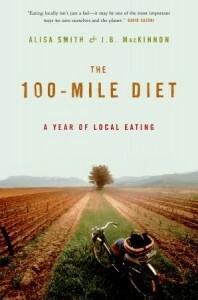 The 100-Mile Diet is a book written by Alisa Smith and James MacKinnon who live in Vancouver, British Columbia. In 2005 they undertook an eating experiment with the goal of only consuming locally grown foods that were grown, produced and processed within a 100-mile radius of their home. Their reasoning for this approach is that there is an incredible amount of energy wasted, particularly fossil fuels, in the process of transporting food over long distances. Additionally foods that travel long distances are less likely to be fresh and have fewer vitamins and minerals than their local alternatives. This is not really a diet book but more of a memoir of the experiences of the authors as they attempt to eat only local foods for a period of one year. They soon realized that this meant they would have to go without certain foods they had become accustomed to such as sugar, olive oil, rice, beer and many others. In the process they explored seasonal eating and discovered a range of new flavors such as gooseberry wine, sunchokes and turnip sandwiches. While the basic concept of the 100-Mile Diet is simple – only eat foods that are grown within 100 miles of your home – the actual locally grown foods will vary greatly depending on where you are located. Anything locally grown, processed and produced within a 100 mile radius of your home. For the authors who live in Vancouver this included fiddlehead ferns, local seaweeds, shellfish, halibut, salmon, cheese, yogurt, celeriac, sunchokes, wild mushrooms, hothouse peppers, cranberries, hazelnuts, blackcurrants, lettuces, honey and local wine. The book does not include exercise recommendations as it just focuses on eating locally grown foods. The 100-Mile Diet: A Year of Local Eating retails at $19.95. Encourages the intake of local fresh seasonal fruit and vegetables. Eliminates foods containing additives and preservatives. Supports the local farming economy. Encourages the planting of a vegetable garden. Can be adapted to suit different budgets. Increases awareness of food production methods. Interesting reading and a unique story. Motivates readers to make positive lifestyle changes. Dieters may feel deprived if not able to eat some of their favorite foods that are not locally available. The diet may become monotonous especially during winter when the variety of fresh produce is limited. May take some time to become accustomed to the locally grown available foods and how to prepare them. May be difficult to maintain as a long-term approach to eating. The 100-Mile Diet serves as a practical example of the possibility and challenges involved in eating only locally produced foods. It will appeal to readers who are interested in taking an active role in supporting the environment. Dieters will generally also benefit from an improved nutritional intake because fresh locally grown foods are usually fresher and thus higher in vitamin and mineral content. Additionally many unhealthy foods and substances will be eliminated such as sugars, additives, and preservatives, which will lead to health improvements by eating locally grown foods.